I try and sneak under the bathroom door to keep my dad company when he is pooping. If I can’t fit my 75 lb body under the door I cry and howl until he’s done. Hahahaha, my Greta does that. Awww – that’s love!! Or major separation anxiety – LOL. Mine (90+ lbs) exhales loudly under the door. Mine has to push the door open 10 times to make sure I didn’t disappear. If I don’t leave the door unlatched, he rams his big head into the door and whines LOUDLY. Ours used to join us in the bathroom. If we closed the door, she’d lay right outside & wait for us to trip over her. One time, my dog came in and laid down between the bowl and my ankles and stayed there until I was done. 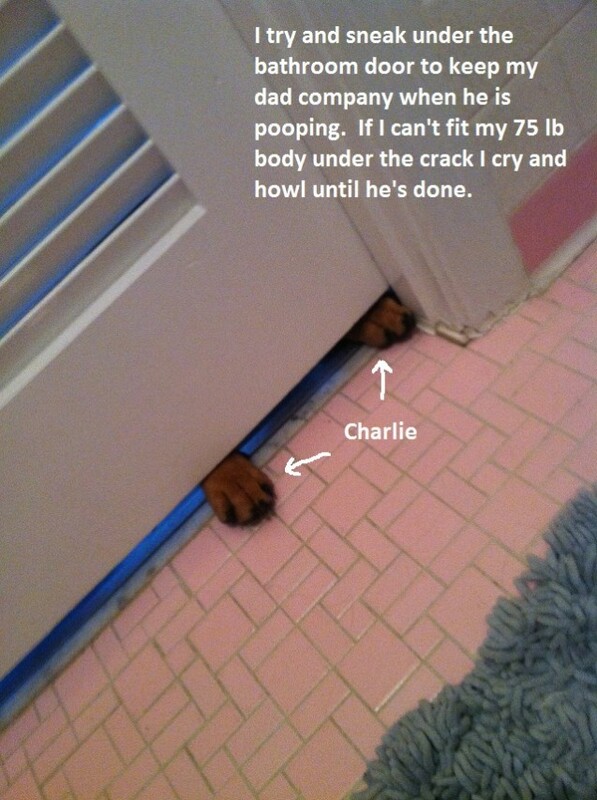 Lol, my dog Sugar does this too. I now tell her to go lay down in her bed while I am in the restroom so she will feel more secure while I am out of visual range. I don’t get to use the bathroom with the door shut anymore. Mine throw a fit if I even try. I have THREE that do the same thing! I’ll never be alone again! I have given up on trying to shut my bathroom door. Now my cat is in on it too and bugs me when I am in the bathroom as well. I guess they see you as a captive audience at that point. ( ; Privacy is way overrated…at least my pets think so! My wife does the same thing. My two girls come in to check on me. When they are satisfied that I’m ok- they also sit in doorway so they know when I’m done. Lol! If I don’t close the bathroom door, my dog will try to get in my lap. I have that same pink tile and that same gray rug. My Springer sits on the window shelf next to me and gives me big kisses, then she puts her paws round my neck and cuddles…. Welcome to our house! All 5 dogs do this! I let them in once. One got tangled in my underwear, and pulled me to the floor! My dogs do the same thing, they need to see what I’m doing when I’m in the washroom, but they don’t bug my boyfriend. It’s funny how they don’t see the need for privacy, but when they do their business, they give you a dirty look asking for privacy. Our youngest Boston does this. We call it the toe game.